It’s obvious who McMahon is really addressing when he points his glassy shark eyes at the camera and says he wants to return the game of football back to “the fans.” Although he’d later claim this XFL revival has nothing to do with the collective tantrum conservatives are throwing over NFL players kneeling during the national anthem to protest institutional racism and police brutality, he also made it clear there’s no room for politics in his football league. “When we come on to the field, we’re here to play football. That’s everyone’s job,” he said, repeating the refrain of angry, privileged NFL fans who—if we listen to the most privileged and angry of them all, perennial liar, WWE Hall Of Famer, and recipient of at least $6 million in campaign donations from the McMahon family, Donald Trump—are turning away from the league in record numbers because they’d rather not see the Black players who destroy their bodies for entertainment make use of constitutionally protected free speech. The XFL returned today with a rap. Really. And of course, what McMahon says is what goes in the XFL. Instead of each team being an independent entity with its own owners, as in the NFL, the league will own all the teams, meaning there’s no room for individual franchises to decide what their players can and can’t do or how to respond if any rules are broken. If players or coaches want to express themselves on social media, McMahon says that’s fine (for now, at least), but you better not do it on his damn platform. No one wants to see that; they just want to watch you get your head smashed in. Speaking of which, the suppression of political speech goes hand in hand with McMahon’s vision of making the game “faster,” more “action-packed,” and bogged down with less penalties. These would be changes to the current NFL model that play into other complaints that are constantly repeated by the same people who are so incensed about the whole kneeling thing. In addition to having to see politics in their football, they also hate wusses and fully functioning brains, because, after all, this is just a veiled way of saying they’re tired of the hits not being as hard as they used to be and penalties being levied for dangerous contact. For a sport that’s already in turmoil over head injuries, and a man who runs a wrestling company that’s being sued over its old concussion practices, it’s despicable to play up the violence. Reporters asked McMahon how the hell the XFL plans to be both safe and harder hitting, but all he had to say is that he’s working with experts to make it as safe as possible. Yes, there are reasons to be tired of football as the NFL presents it that don’t intersect with the willfully ignorant, implicitly racist rantings of the right. As McMahon himself points out, games drag on for what feels like an eternity. 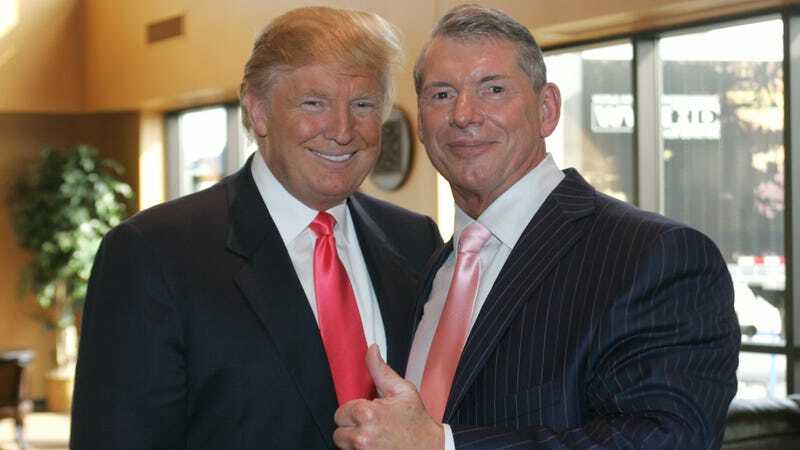 (Although, it’s an ironic complaint, considering he has full creative control over a weekly three-hour wrestling show that’s just as guilty of being, as he says of the NFL, “laborious.”) But despite all the PR speak he peddles, it’s impossible to look at the timing of this XFL revival—not to mention the man’s relationship to conservative politics—and see anything other than an attempt to recapture all those disillusioned whiners with the apolitical American sport of their dreams. The move is extra disgusting when you consider that the president of the United States attempted to use his platform to drive people away from the NFL, and now one of his biggest donors, and the husband of a member of his administration, is attempting to capitalize on the perceived business impact all that rage has caused. (“Perceived” because, much like the rock-solid economy Trump loves basking in despite inheriting it from Barack Obama, NFL ratings started dropping in 2016, and even though the numbers are down, they’re still light years ahead of most things on TV, including McMahon’s WWE shows, whose ratings have been in decline for years.) All there is to do now is wait for the official state-sponsored tweets about “Making football great again” to roll in.